Tau filaments isolated from an Alzheimer’s brain are the latest, high-profile exploit of cryo-electron microscopy. Crafting a technique that has become his claim to fame, Sjors Scheres of the MRC Laboratory of Molecular Biology in Cambridge, England, teamed up with Michel Goedert, also at MRC, to solve 3.4-Angstrom resolution structures of both straight and paired helical filaments of tau. The structures, first unveiled at the AD/PD meeting in Vienna last March, were formally published in Nature on July 5. The two filament subtypes varied at the ultrastructural level, yet shared a common C-shaped protofilament monomer made up of a series of β-sheets from the third and fourth repeat domains of tau. Two of these Cs tethered together to form each rung of the fibril. This pairing was a bit different in paired helical versus straight filaments, bestowing each fibril subtype with a distinct ultrastructural signature. “This study represents a breakthrough in our understanding of the pathological conformation of tau,” commented Markus Zweckstetter of the Max Planck Institute for Biophysical Chemistry in Göttingen, Germany. 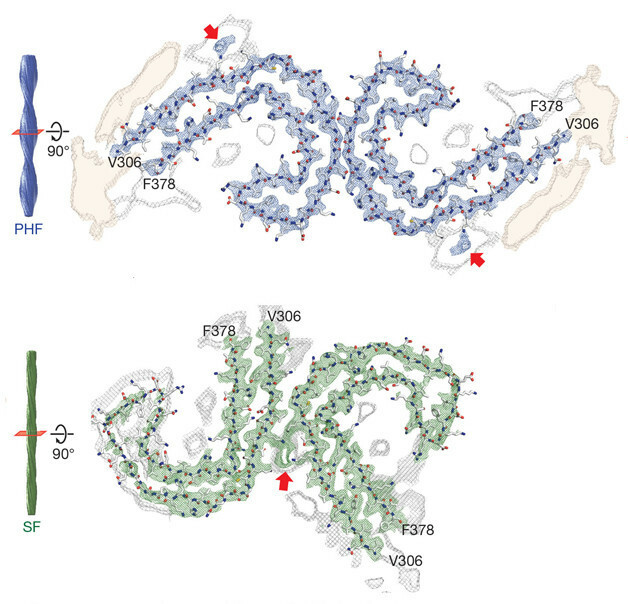 The findings also set the stage for future cryo-EM conquests of tau fibrils from different stages of AD and in other tauopathies, he added. Researchers have been struggling to understand if different forms, or strains, of tau distinguish different tauopathies or different phases of disease progression. First author Anthony Fitzpatrick and colleagues solved the structures by looking at the end product of tau aggregation: the filamentous tangles crowding the cortex of a 74-year-old woman who died after a 10-year history with AD. The researchers isolated tau aggregates from the sarkosyl-insoluble fraction of the tissue. As assessed initially by immuno-electron microscopy, the sample contained a mixture of paired helical filaments (PHFs) and straight filaments (SFs), the former making up about 90 percent of the total, according to Scheres. The filament mixture potently triggered aggregation of full-length tau in cultured cells. Immunoblots also revealed that both PHFs and SFs contained all six alternatively spliced isoforms of tau, including those containing all four microtubule-binding repeat domains, and those missing the second repeat (R2). Tau fibrils from the AD brain are known to contain a mixture of 3- and 4-repeat tau, while those in other tauopathies tend to contain only one or the other. Next the researchers examined the insoluble tau using cryo-EM. Fitzpatrick could see that while PHFs and SFs had different shapes, they shared a common subunit at the core (see image above). Two C-shaped structures, each formed by a molecule of tau, bound together to form individual rungs along the filament. In PHFs, the two Cs assumed a symmetrical configuration, while in SFs, these Cs were arranged slightly off-kilter (see images above). The 3.4Å resolution allowed the researchers to discern the amino acids incorporated into the fibril core. Each C-shaped structure spanned amino acids V306-F378, which contained the entire R3 and R4 repeat domains, plus an additional 10 amino acids C-terminal to the repeats. To determine if the R3 and R4 domains were necessary and sufficient to form the core, they treated their filament samples with pronase, which is known to remove all but the cores of tau fibrils. Cryo-EM structures of treated samples still contained R3-R4, indicating that these domains formed the essential component of the fibrils. The researchers also found that an antibody specific for the R2 domain labeled filaments before, but not after, pronase treatment. This indicated that at least some filaments were composed of R2-containing 4-repeat tau, but that only the R3 and R4 domain made up the ordered core of the filament. The researchers presented the C-shape in striking detail. It consisted of eight β-strands, with strands 6-8 folding back on strands 1-5 to create the inside of a “two-ply” curved structure (see image above). Hydrophobic interactions and hydrogen bonds held the two plies together. The structure’s most distinctive part was an uncommon β-helical fold formed by the triangular arrangement of β sheets 4-6. This β-helix is distinct from the overall helical structure of the tau fibril. Complex β-helical folds such as these require very specific sequences to form, Goedert said. This could point to the importance of this motif, and the R4 domain that houses it, in defining the structure of AD tau fibrils, he said. While both PHFs and SFs shared these common protofilaments, the ultrastructural differences between the two stemmed from the way they lined up with each other. In PHFs, the C-shaped subunits paired up symmetrically, tethered at the base of each C by anti-parallel interactions between the 332PGGGQ336 motif in β-sheet 3. Rock-solid hydrogen bonds stitched the Cs together. In SFs, the two Cs joined asymmetrically and interacted weakly. Although the two subunits came close to touching via their R3 domains—at 321KCGS324 on one C, and 313VDLSK317 on the other—they were not held together via hydrogen bonds, salt bridges, or hydrophobic interactions. Instead, a region appearing as a fuzzy density on the cryo-EM appeared to span the two. The researchers speculated that this bridge could be none other than tau’s N-terminus, looping back around to stabilize the SF core (see image below). This hypothesis is based on epitopes for two tau antibodies—Alz50 and MC-1—being an amalgam of 7EFE9 in tau’s N-terminus and 313VDLSKVTSKC322 in R3, the same region where the two Cs almost touch (Carmel et al., 1996). NMR analyses of recombinant 4-repeat tau have also placed the N-terminus near the fibril core (Bibow et al., 2011). If true, then removing or mutating tau’s N-terminus should prevent the formation of SFs altogether, Scheres told Alzforum. The structure helps explain why tau fibrils in AD accommodate tau isoforms with both 3- and 4-repeats. The protofilament core only contains regions common to both types of isoform—namely the third and fourth repeat domains—so theoretically, a mixture of both isoforms could weave into the same fibril. Because tau filaments in other tauopathies contain only 3-repeat or only 4-repeat tau, Scheres and Goedert think they probably have an entirely different core. Perhaps filaments in 4-repeat tauopathies, such as progressive supranuclear palsy and corticobasal degeneration, weave the R2 domain into their core, which would exclude 3-repeat tau. The researchers are gathering postmortem brain samples from patients with other tauopathies for cryo-EM analysis. Such differences in the fibril core could form the basis of different “strains” of tau that other researchers have observed. Marc Diamond of the University of Texas Southwestern Medical Center in Dallas has reported that tau strains, extracted from people and animals with different tauopathies and mutations, retain their distinctive physical attributes and pathogenic characteristics when passed between animals or in cell culture (May 2014 news and Nov 2016 news). Fitzpatrick’s cryo-EM structure might represent but one of these strains, commented Diamond. “Given the diversity of tau strains out there, the field collectively has a lot of work to define the many structures that no doubt exist,” he said. The key role of the R3 domain in the AD tau fibril core dovetails with findings garnered from recombinant tau proteins, but the crucial involvement of the R4 domain was unexpected, commented Zweckstetter. That R4 contains the pivotal β-helix motif also speaks to the potential importance of the domain in fibrils from the AD brain, Scheres told Alzforum. Interestingly, the yeast prion protein Het-s also forms a β-helix, so the researchers speculated that the R4 helical motif could play a role in prion-like propagation of tau. The researchers also proposed that the β-helix could house the binding site for tau-PET tracers, which preferentially latch onto tau fibrils from the AD brain. To test this idea, they plan to generate cryo-EM structures of tau filaments bound with the AV-1451 PET ligand, Goedert said. Solving this hybrid structure, and the structures of filaments from other tauopathies, could help researchers understand how to better label and target a variety of tau strains. Jürgen Götz of the University of Queensland in Brisbane, Australia, agreed that the structure could help inform therapeutic strategies. “The remarkable detail in tau structure and how it differs between fibrillar and microtubule-bound tau should be useful in pursuing more targeted pharmacological strategies,” he wrote. Goedert pointed out that the filament structures only represent the end product of tau aggregation, and tell us little about how the process began. While snipping off the protein’s “fuzzy coat” did little to alter the fibril’s core structure, this does not exclude a role for other parts of the protein in the initial formation of filaments, he said. Indeed, parts of the protein known to be hyperphosphorylated—a process that some researchers view as essential for aggregation—lie outside of the R3 and R4 domains. The role of tau fragmentation and oligomerization in kick-starting aggregation is also unclear based on the structure, he said.